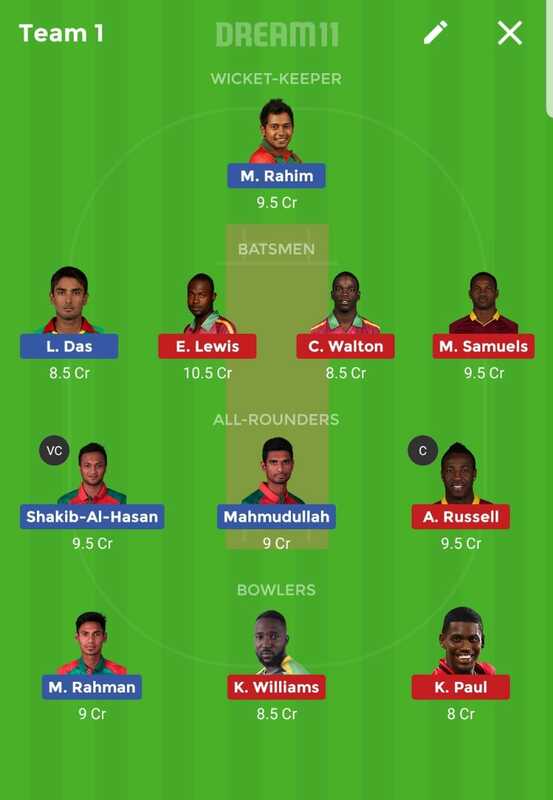 *Chris Gayle is rested for this series but the inclusion of Marlon Samuels and C Brathwaite would have boosted host moral. *In Gayle absence any of Chadwick Walton or Andre Fletcher and Evin Lewis will open the inning for the host. *Evin Lewis will be key for the host as he looks a different player in this format, this format suits him a lot. 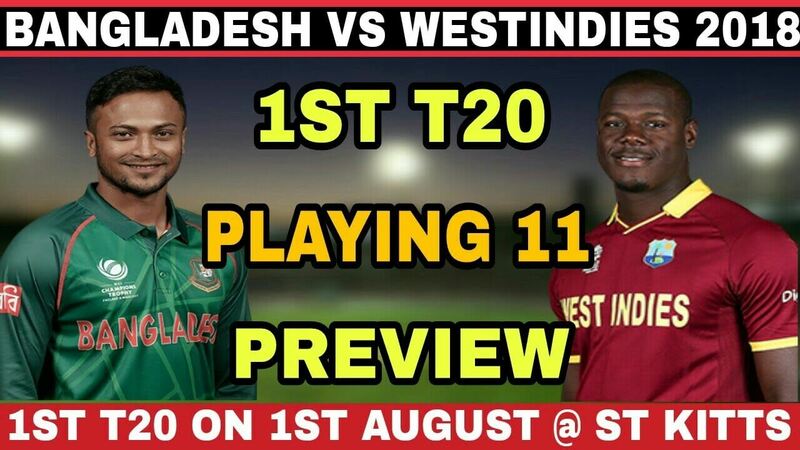 *Marlon Samuels will bat at number 3 for them and if needed he can bowl some over for them. *Andre Russell and C Brathwaite will lead their pace attack in this match. *Due to last ODI match performance R Powell should be included in playing11. *Andre Russell will be key allrounder for them and he can be promoted anytime for hitting. *West Indies’s fast bowler’s are risky in this format as they shuffle their combination in every match. *Any 2 of Cottrell, Keemo Paul, and Kesrick Williams will play. Keemo Paul has a slight high chance. *Mustafizur is back in the T20s squad and he will lead the pace attack. *Their spinners Shakib and Mehedi Hasan bowled well on a spin-friendly wicket. *In batting department Tamim Iqbal, M Rahim, and Shakib Al Hasan will be key for the team and team will want big innings from them again. *Mahmudullah will do the late hitting duty and will give finishing touch to the inning. *Shakib Al Hasan and Mehedi Hasan are expected to lead the spin attack. However, Mehedi will have to compete with T20 specialist Nazmul Hasan for a place. *Tamim Iqbal and Litton Das will open the inning while Shakib will bat at number 3 for them. *If condition will allow them then Nazmul Islam can play as the third spinner. *Rubbel Hossain has bowled well in recently concluded one-day series so he should be preferred as 2nd fast bowling option for them.